By March of 2014, it was clear that something was wrong. In treatment centers throughout Guéckédou, a small town of 300,000 in Southern Guinea, a number of patients had high fevers, diarrhea, and unexplainable pain (1). Medical responders in Médecins Sans Frontières (Doctors Without Borders) who were already stationed in Guinea for an earlier project were puzzled. After initial reports were sent back to Europe, these responders sent blood samples to European labs that eventually sequenced the virus. After a full-length genome sequencing, the virus was identified as Zaire ebolavirus (EBOV) (2). The Zaire virus was by no means new to Africa. 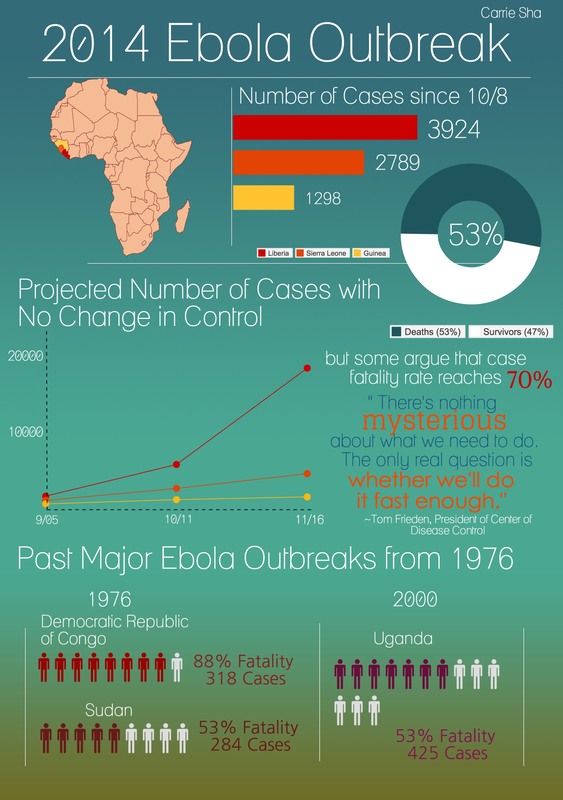 As early as 1976, Zaire outbreaks had an 88% case fatality in the Democratic Republic of Congo (3). Yet, the 2014 outbreak featured a novel strain of Ebola, one that had evolved in parallel to strains in the Congo and belonged to a separate clade. Through the work of epidemiologists, the strain was traced back to December 2013 and the virus’s host to the bat family Pteropodidae (2). This was only the beginning of what, as of now, has been seven months of grueling effort in the Côte d’Ivoire to contain the Ebola spread. While the efforts of humanitarians in Liberia, Sierra Leone, and Guinea form the backbone of the containment process, researchers around the globe have naturally looked to drugs to find a way to stop the outbreak. After nearly a decade of experimentation in anti-Ebola drugs, the most effective treatments against EBOV turn out to be cocktails of monoclonal antibodies (4). The body produces antibodies in response to antigens—foreign materials, such as viruses. These antibodies are attached to the surface of B-cells, which trigger the immune response. Whereas polyclonal antibodies are a mixed bag of receptors that all respond to the same expressed antigen, monoclonal antibodies are produced by the same B-cell (5). One of these antibody treatments is MB-003, which has been tested somewhat successfully in non-human primates, such as rhesus macaques. While in past control studies, the monkeys all died approximately ten days post-infection with EBOV, the experimental monkeys had a 43% survival rate, meaning that three out of seven survived (6). Out of the three that survived, two of the monkeys showed a near-complete recovery, whereas the third still had symptoms of the Ebola infection (6). Another antibody drug developed in 2013, ZMAb, provides a similar effect, allowing two out of four cynomolgus macaques to survive after EBOV infection (7). But this time, the researchers experimented with other non-antibody drugs in combination with the ZMAb. They combined ZMAb with Ad-IFN, an adenovirus vector previously shown to be effective against Western equine encephalitis virus in 2007, with a 100% survival rate (8). Although Ad-IFN alone without ZMAb has no potency against Ebola, a combination of the two drugs allowed three out of four cynomolgus macaques and four out of four rhesus macaques to survive post-infection (7). While the exact mechanism of how these drugs interact to enhance survival remains unknown, the cocktail treatments surely had their effect, increasing survival from 50% to 75% and 100%. The use of a cocktail drug is exactly the basis for the current drug development against Ebola, ZMapp. This project, led by researchers around the world, screens for the best MAb components, seeking to combine the benefits of both ZMAb/Ad-FN and MB-003 (4). In doing so, the researchers also want to extend the number of days post-infection that the drug must be administered in order to mimic current difficulties in identifying the infection in West Africa. By testing first on guinea pigs, they identified c13C6 as the essential component in MB-003. Then, they combined c13C6 with a number of different components found in ZMAb, creating three cocktails: Zmapp1, Zmapp2, and Zmapp3. The guinea pigs who had received the Zmapp1 treatment, which contains c2G4 and c4G7 components from ZMAb, showed the greatest survival at four out of six. Zmapp2 treatment offered moderate survival, with three out of six guinea pigs surviving. Both Zmapp1 and Zmapp2 were than used on rhesus monkeys. The results: six out of six monkeys survived after Zmapp1, and five out of six survived after Zmapp2 (4). Despite this improvement in drug discovery in less than a year, the future of these drugs remains doubtful. One of the major problems facing the implementation of antibody cocktails in the field is the rigorous process and standards of drug testing. In the words of Armand Sprecher, a representative of Doctors without Borders, “There are rumors that we are spreading disease, harvesting organs, and other horrible things. Bringing in unlicensed things to experiment on people could be very counterproductive.” (9). Carrie Sha ’17 is currently a sophomore in Mather House. World Health Organization (2014). Ebola virus disease. Retrieved from http://www.who.int/mediacentre/factsheets/fs103/en/. Center for Disease Control and Prevention (2014). Review of Human-to-Human Transmission of Ebola Virus. Retrieved from http://www.cdc.gov/vhf/ebola/transmission/human-transmission.html. Boston Children’s Hospital and Harvard Medical School (10.8.2014). Modeling Ebola in West Africa: Cumulative Cases by Date of Reporting. Retrieved from http://healthmap.org/ebola/#projection. Center for Disease Control and Prevention (2014). 2014 Ebola Outbreak in West Africa – Outbreak Distribution Map. Retrieved from http://www.cdc.gov/vhf/ebola/outbreaks/2014-west-africa/distribution-map.html. Vogel, G. (2014). How deadly is Ebola? Statistical challenges may be inflating survival rate. Science Insider. Retrieved from http://news.sciencemag.org/africa/2014/09/how-deadly-ebola-statistical-challenges-may-be-inflating-survival-rate. Center for Disease Control and Prevention (2014). CDC Media Briefing: update on the Ebola outbreak in West Africa. Retrieved from http://www.cdc.gov/media/releases/2014/t0902-ebola-outbreak.html. Baize et al. (2014). Emergence of Zaire Ebola Virus Disease in Guinea. N Engl J Med, 371, 1418-1425; City Population (2014). Guéckédou (Prefecture). Retrieved from http://www.citypopulation.de/php/guinea-admin.php?adm1id=82. Baize, S. et al. (2014). Emergence of Zaire Ebola Virus Disease in Guinea. N Engl J Med, 371, 1418-1425. World Health Organization (2014). Ebola virus disease. Retrieved from http://www.who.int/mediacentre/factsheets/fs103/en/. Randox Life Sciences. Polyclonal Antibodies vs. Monoclonal Antibodies. Retrieved from http://www.randox-lifesciences.com/articles/57?articleSectionId=1. Pettitt et al. (2013). Therapeutic Intervention of Ebola Virus Infection in Rhesus Macaques with the MB-003 Monoclonal Antibody Cocktail. Sci. Transl. Med., 5(199). Qiu et al. (2014). Reversion of advanced Ebola virus disease in nonhuman primates with ZMapp. Nature, 514, 47–53. Qiu et al. (2013). mAbs and Ad-Vectored IFN-α Therapy Rescue Ebola-Infected Nonhuman Primates When Administered After the Detection of Viremia and Symptoms. Sci. Transl. Med., 5(207). Wu et al. (2007). Pre- and post-exposure protection against Western equine encephalitis virus after single inoculation with adenovirus vector expressing interferon alpha. Virology 369, 206–213. Enserink, M. (2014). Ebola drugs still stuck in lab. Scienc,e 345(6195), 364-365.